Rijndael encryption algorithm. Secure key creation from given password. Using Isolated Storage for storing per-user configuration. Extracting icons associated with files, using Win32 shell.Enter password for encryption. Define folders you want to protect. Select active folder to work with. Encrypt files selected in left listbox by clicking "move right" button. Decrypt files by clicking "move left" encrypted files in right listbox. * Enter password for encryption. * Define folders you want to protect. * Select active folder to work with. * Encrypt files selected in left listbox by clicking "move right" button. * Decrypt files by clicking "move left" encrypted files in right listbox. Rijndael was evaluated based on its security, its cost and its algorithm and implementation characteristics. The primary focus of the analysis was on the cipher's security, but the choice of Rijndael was based on its simple algorithm and implementation characteristics. There were several candidate algorithms but Rijndael was selected because based on the analyses, it had the best combination of security, performance, efficiency, ease of implementation and flexibility. 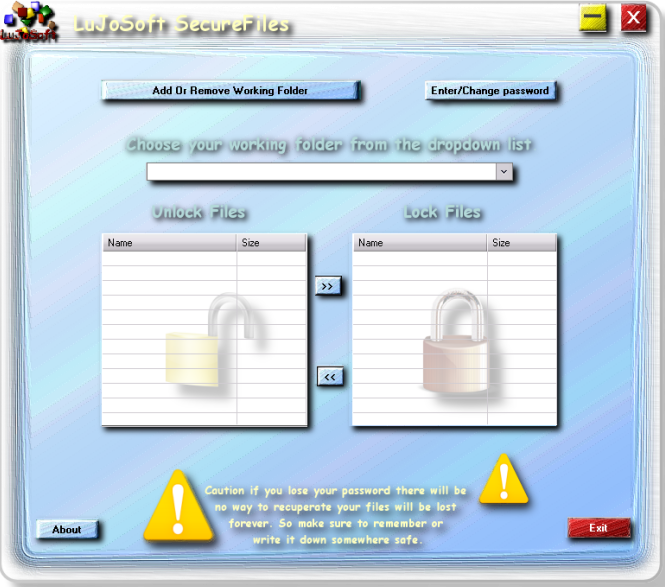 Qweas is providing links to SecureFiles 2010 as a courtesy, and makes no representations regarding SecureFiles or any other applications or any information related thereto. Any questions, complaints or claims regarding this application SecureFiles 2010 must be directed to the appropriate software vendor. You may click the publisher link of SecureFiles on the top of this page to get more details about the vendor.